After three months of lessons I didn’t have faith in the Wing Chun punch (also called the straight punch). I felt like I was hitting someone with a pillow rather than my fists. It was like a childhood nightmare where I tried to fight back a monster and my arms and fists turned into cotton. Useless! A lot of new Wing Chun artists run into the same problem. If you are too, don’t give up. Everyone improves. I see it happen all the time at my local kwoon and it happened to me. Why Do So Many Martial Artists Find The Wing Chun Punch Difficult To Do? Learning the this punch is challenging for many martial artists because it’s unnatural. If you think about it, the natural human punch is a gross motor skill. Have you ever watched a nature show on TV and seen how bears or tigers fight? They swing their arms in wide arcs to pummel the opponent or prey. It’s a natural movement for humans too. Also, a Wing Chun punch uses a vertical fist. A vertical fist means that the knuckles are aligned vertically with the body (parallel). This also helps keeps the punch straight. But most other punches from boxing or martial arts are horizontal to the body (perpendicular). Fortunately, everyone who sticks with it, learns it. And it’s all worth it. Before getting to the tips for improving your straight punch and making it more natural and powerful let’s touch on some of its benefits. The near invisibility (actually it looks more like a blur rather than invisible) is accomplished by a number of factors that all work together. Simple geometry helps keeps the straight punch invisible. The shortest distance between two points is a straight line. This “shortest distance” therefore allows the fastest travel. Plus, the short distance the punch travels requires you to stand close to your opponent. Being close also makes it difficult for your opponent to see your strike coming. Don’t wind up to throw the Wing Chun punch. Winding up telegraphs (gives away the fact) that you’re preparing to throw a punch. In simple terms this Wing Chun concept means flexibility and flow. An attack can turn into a retreat or a counter-attack... a punch can turn into a block, in an instant, in mid-flight - all before you complete the initial move. 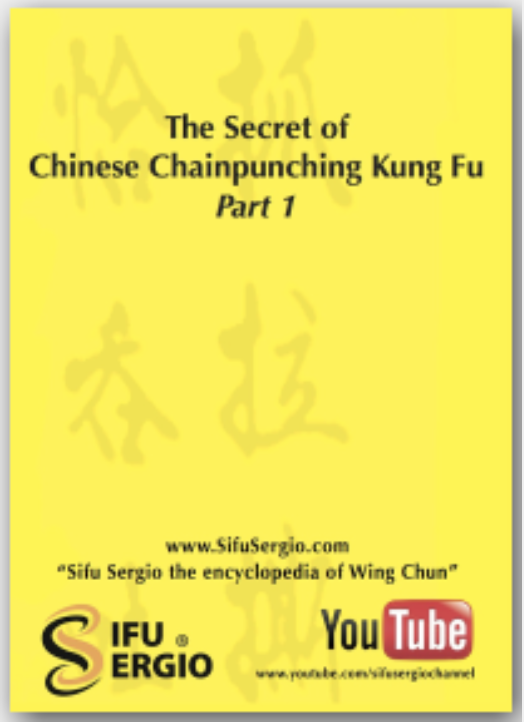 The Wing Chun punch is most likely the first way you learn to apply the concept of interruptability. Throw two or more Wing Chun punches in rapid succession and you now have the roll punch (also known as the chain punch). As the first punch begins to retreat from its attack the second punch has already landed its attack. It’s like getting hit with a machine gun. From the roll punch you learn the cover punch. Which means you’re blocking, or covering, one of the opponents arms while you’re striking (doing so limits the opponent’s options to counter-attack, allows you to control the balance, and gives you chi sao benefits). Like the roll punch, you continue to alternate the covering and striking hands until the opponent is out of the game. These skills are made possible because of interruptibility. Interruptibility and its straight path also allow the Wing Chun punch to be very accurate. Accuracy means that less force is needed to get the desired effect because the straight path focuses the force directly onto the target. Compare it to the guided missile, the Javelin. It's only 18-pounds (8.4 kg) but can take out an entire tank because of its pin-point accuracy. Interruptability also aids in accuracy because it allows you to change the direction and target of your attack in mid-flight. For instance, if you’re attacking the face and the opponent raises the guard to protect the face. Don’t finish the attack by landing on the guard (arms or hands) and waste the move. Instead, change direction and strike the new openings (in this case, probably the ribs, liver, or kidneys). The Wing Chun punch has a lot of power when done right. But it is not the most powerful punch in all martial arts. Very powerful punches require that you throw your weight behind the strike to rip your opponent’s head off. This also allows you to stretch your punch out to reach your opponent from farther away. The main drawback is that you must over-commit your balance. Because the Wing Chun punch is a short distance punch it relies on proper footwork and body structure to reach the target, not stretching out and throwing your body weight behind the punch. If you feel, as I did, that you’re hitting someone with fists and arms sewn from a down pillow, it’s because you haven’t internalized the proper mechanics. The basic mechanics from the arms is like the mechanics used to push on a refrigerator. Stand up against your fridge (or the wall). Let one toe touch it. Place your fist on the fridge, now flex your elbow and feel the push. The Wing Chun punch comes from the elbow. At this point you just want to understand the basic movement of the arm(s) and how the elbow leads the Wing Chun punch (this punch doesn’t come from the shoulder). Keep your hands at or within your shoulder width, and somewhere from chest to shoulder height. Keep your elbows in (which means pointed down). Not out to the side. Once you understand this you’re 87 percent to an effective Wing Chun punch. Mimic this movement in the air. Then go back to the fridge. And alternate until you get it and build it into muscle memory. The Wing Chun punch comes from the elbow. Most other punches come from the shoulder. Keeping your elbows in (pointed down) helps the punch come from the elbow. If you elbows spread out to the side you’ll want to use more shoulder strength to throw the punch. Throw the Wing Chun punch - don’t push it. Pushing against your refrigerator is an analogy to help you quickly grasp the motion (otherwise it can take you months to get it). In real life you’re throwing the punch and impacting it into your target (using the movement or motion of muscles used in pushing). A common mistake is striking down. This typically happens because you're keeping the elbow in and concentrating on the motion coming from the elbow. What happens is that you start to swing the fist down (sometimes it’s so slight you don’t notice it). If this is happening to you think of your punch like an arrow driving into your target. Not a hammer swinging down. Once you train this finer detail you’ll have even more power behind your strike because, swinging down wastes energy. Hitting straight through concentrates the force onto the small area of the target. [Update: I used to believe, like many others, that it is appropriate to "Keep a loose grip with your fist. Clenching your fist and tightening your muscles will slow you down. You ought to keep a tight fist (and make sure your wrist is firm as well, otherwise you can sprain or break it if it twists or collapses when you hit someone). A tight fist is essential to hitting hard. Make it like a rock. The trick is tightening the fist, without slowing yourself down. Practice against a heavy bag helps. Make your fist tight and throw fast punches and roll punches. Many people say doing push ups on your fists helps strengthen the writs to better take the pounding without collapsing. A lot people have the habit of standing on their toes when hitting. This dissipates the force. For one thing you want to hit with your entire body mass behind the strike. Just as important, you want to displace your target. This ensures you are hitting through the target with your entire mass. Put a slight twist in hips. Very slight, just enough to give your punch extra power from your core but not so much that you give up your balance. Point the feet in the direction of your punch. A bad habit that took me a long time to get rid of was that my rear foot got lazy and pointed out (almost at a 90 degree angle) from the direction of my target. This dissipates the force, too. So, keep your body aimed at your target (aimed forward) this focuses your energy, your intention and power into your target. All the above is meant to make your Wing Chun straight punch effective if you’re having trouble with it. And to make sure your opponents respect it and are taken out by it. Too close - Your punch will be snuffed and lack all power. A bit too far - You won’t hit with enough penetration to do any damage. Much too far - You’ll miss completely and waste your energy by throwing a punch that hits air.